Feline Stomatitis – this is a condition marked by severe, painful inflammation of the mouth and gums. There is no single cause, but dental disease, inflammatory responses, and certain viruses all may contribute to feline stomatitis. Extraction of all affected teeth is one of the only treatments available. Tooth Resorption – this is a common feline dental problem, affecting 20 to 60% of all cats. With tooth resorption, the tooth dentin develops painful lesions at or below the gumline, and the tooth enamel then erodes away. Eventually, the entire tooth, from root to crown, can become affected. Dental x-rays are the best way to evaluate the tooth if a lesion is observed. Tooth fractures – a cat’s canine teeth are at particular risk for fractures. The pulp chamber exists very close to the tip of the tooth, and so even tiny cracks can expose this sensitive tissue, leading to pain, decay, and further problems. Disinterest in food doesn’t usually happen unless dental disease is already quite severe – and we want to catch it long before that occurs. We examine your cat’s mouth at each annual preventive care exam. A professional dental cleaning is recommended for all cats once a year, since they are so susceptible to dental disease. When your pet is under general anesthesia for her cleaning, we can perform a detailed evaluation of each tooth, perform digital dental x-rays, and scale and polish each tooth. Your part is to make sure your cat keeps her regularly scheduled exams and cleanings, even if she seems well. It’s a win-win to catch dental disease early – your cat is more comfortable, and it’s less expensive for you in the long run, too. 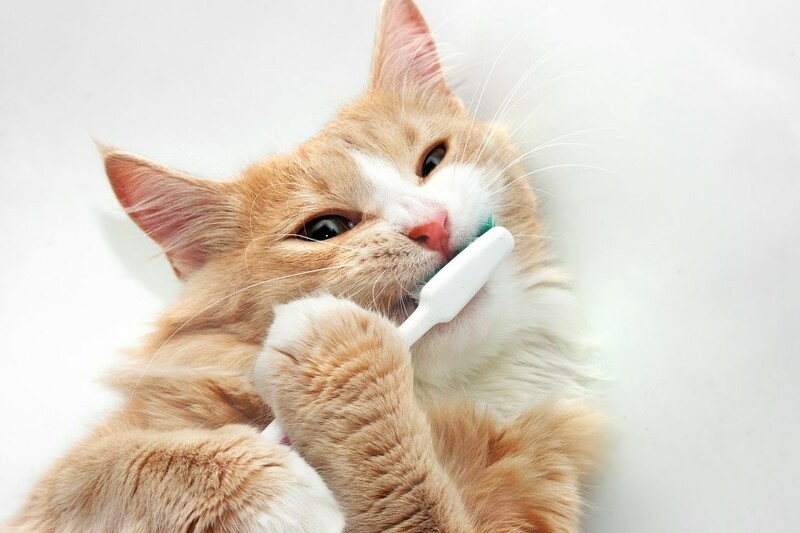 One other way you can help with feline dental care is to regularly brush your cat’s teeth. Did we just lose you? We hope not, because this is actually one of the very most effective means of preventing dental disease in cats (and dogs, for that matter). Our team is skilled at this process and can teach you how, and even adult cats can learn to tolerate and even enjoy this daily attention from you. Please don’t hesitate to contact us for more information or to schedule an appointment. We love cats, understand their unique needs, and look forward to seeing you and your kitty soon.